Born in Berlin and the son of a ropemaker, Ludwig Tieck displayed a talent for writing while he was still at school. During this time, he became good friends with Heinrich Wackenroder. Tieck attended lectures on literature, philosophy and classics and Erlangen, but abandoned his studies to concentrate on his writing. He went on to become one of the most famous German writers and even made a name for himself in America. 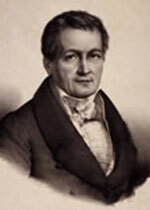 His most prominent patron was King Friedrich Wilhelm IV of Prussia.